Takes 50 Minutes Minutes , serves 8 pies. Prepare pie dough recipe. Refrigerate dough for at least one hour before use. 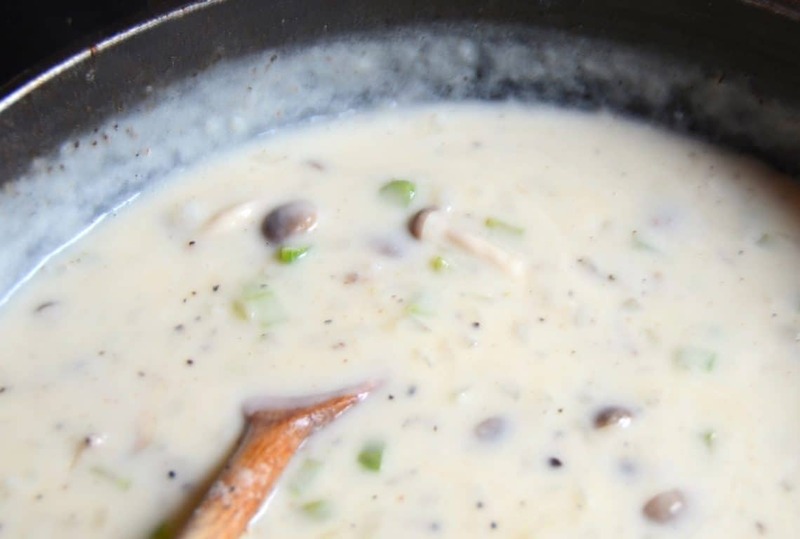 Bring poultry stock to a boil in a small saucepan, then reduce to a simmer. Parboil carrots and rutabaga. Drain and transfer to a bowl half full of ice water to cool. Strain. Dice these vegetables into small bite-sized pieces and reserve. Heat a large skillet on medium-high heat. Add bacon and cook until fat renders and bacon is slightly crisp. 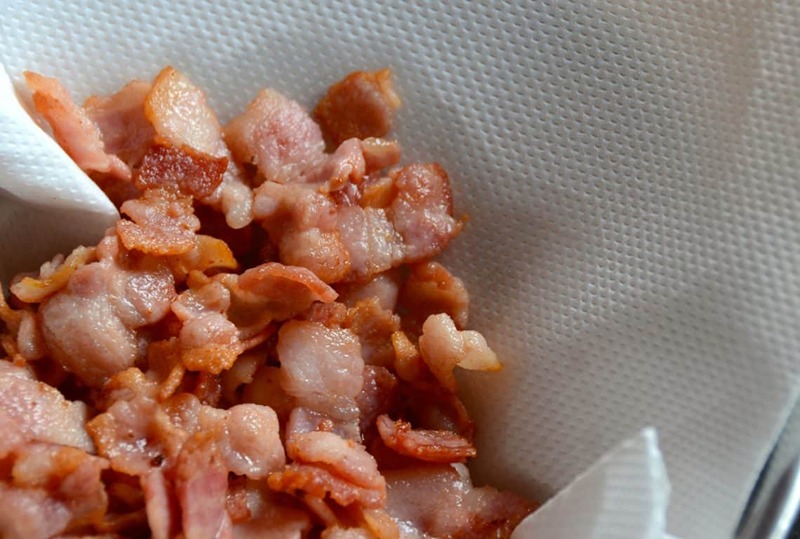 Transfer bacon into paper towel-lined bowl. Add onions to skillet and sauté over medium heat for 10 minutes until translucent. 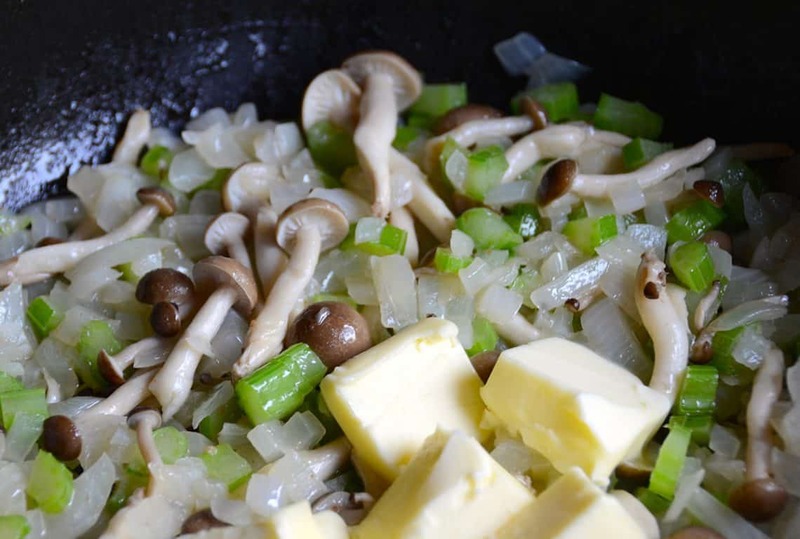 Add celery and mushrooms and sauté for an additional 5 minutes. Reduce heat to low, add butter and melt into cooked vegetables. Add the flour and cook over low heat, stirring constantly, for about 2 minutes. Add the hot poultry stock to skillet and simmer over low heat until sauce thickens. Once sauce has thickened, stir in Dijon mustard followed by heavy cream. Remove skillet from heat. 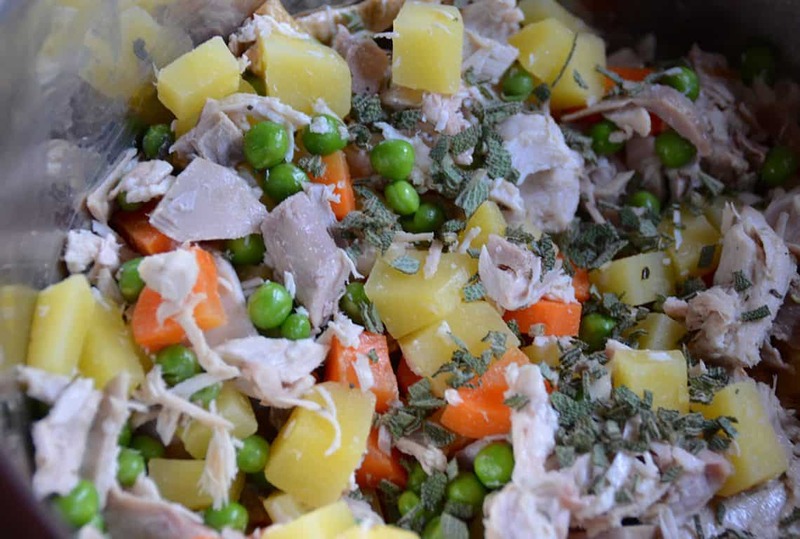 In a large stainless steel bowl, add the cubed turkey, vegetables and chopped parsley. Pour the sauce into the bowl and stir gently. Taste, then adjust salt and pepper accordingly. Transfer filling into 8 individual 5-inch tart or ramekin dishes. Any excess filling can be enjoyed as a hot sandwich and can be stored in an airtight container for up to three days. Transfer pie dough onto a floured surface. Taking a floured rolling pin, roll out dough into a rectangular shape. Using a ravioli cutter (fluted pastry wheel), cut long strips, about 1/8-inch wide. Lay strips horizontally across the pie, evenly spaced. Lay a strip down vertically along a far side of the pie, running over one horizontal strip, then under the next. Lay another strip down vertically in the same fashion, but reverse the over/under pattern. Continue weaving remaining strips to complete lattice effect. Repeat until all of the pies are covered in the same manner. Whisk egg and water together to create an egg wash and brush on top of pastry. 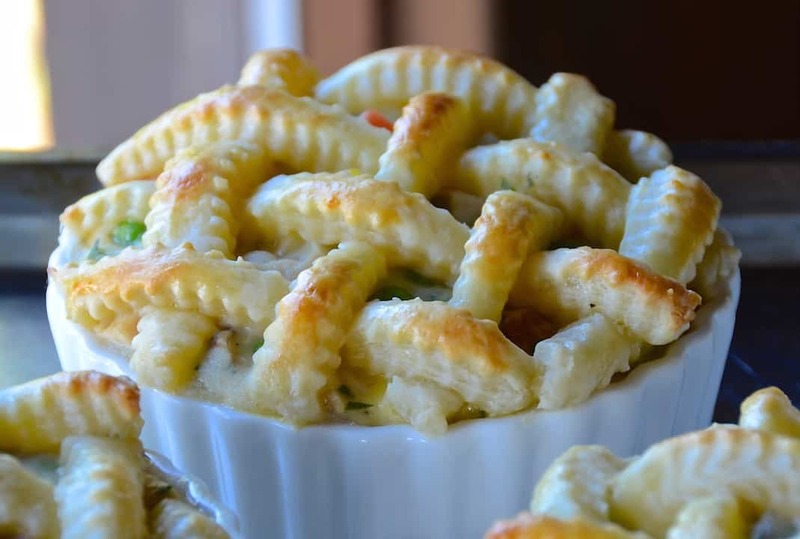 Place pies onto a baking sheet and bake in oven for 20 minutes or until filling is bubbling and crusts are golden brown. Transfer filling into a buttered, 11 x 13-inch glass casserole dish. Transfer pie dough onto a floured surface. Taking a floured rolling pin, roll out dough into a 13 x 15-inch rectangle. Roll dough back up onto rolling pin and gently unroll it over the casserole dish. Trim off excess dough and gently crimp the edge in an attractive fashion over the the dish. Using a small paring knife, cut 6 or 8 evenly spaced vents into the dough. 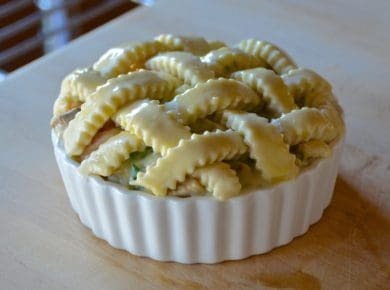 Brush with egg wash. Place casserole onto a baking sheet and bake in oven for one hour, or until pie is bubbling and crust is a golden brown. 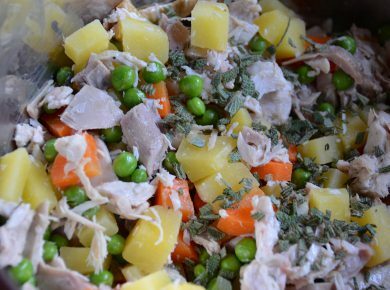 Roast turkey leftovers get a makeover, and the end results are gorgeous, INDIVIDUAL TURKEY POT PIES! 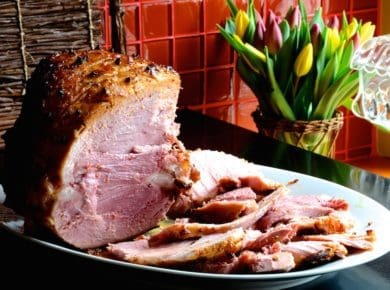 We first posted this recipe a few years back, and it’s been one of our most popular ever since. 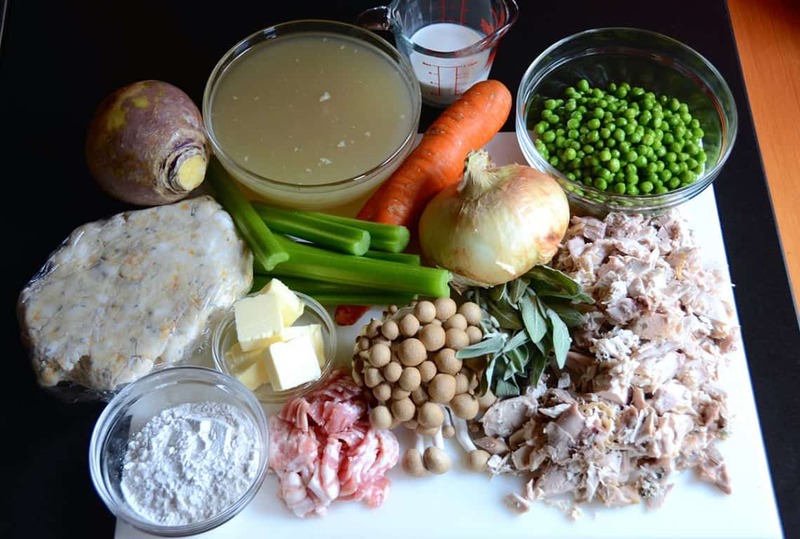 If you’re looking to make a memorable and seriously delicious turkey pot pie from scratch, you’ve come to the right place. Don’t worry, you can do this! 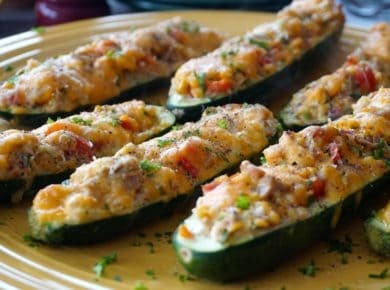 This recipe has also been updated a few times and we’re offering two different methods of preparation. 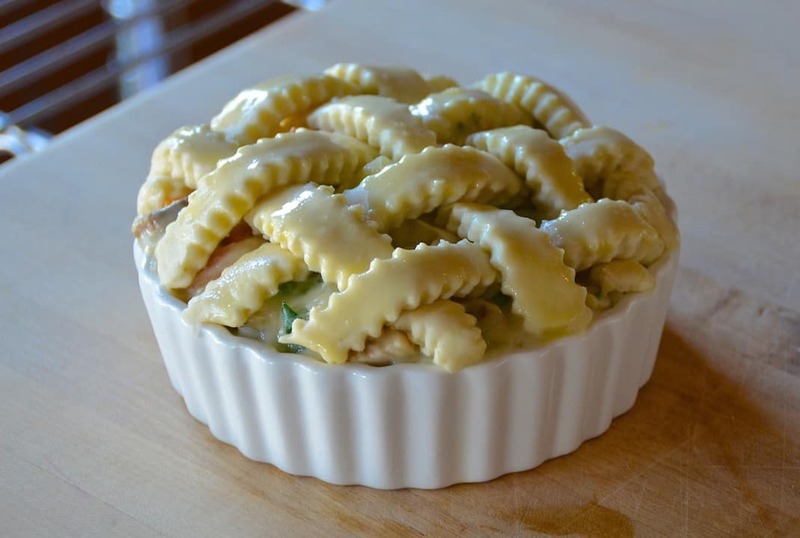 Our first way was a simple version made in a glass casserole dish. 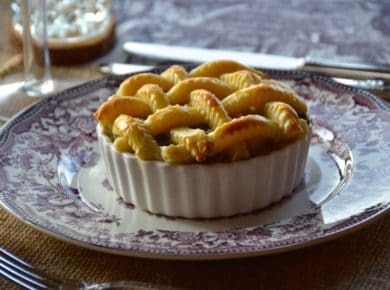 This second way though, traditional turkey pot pie with puff pastry is taken to a whole new level. 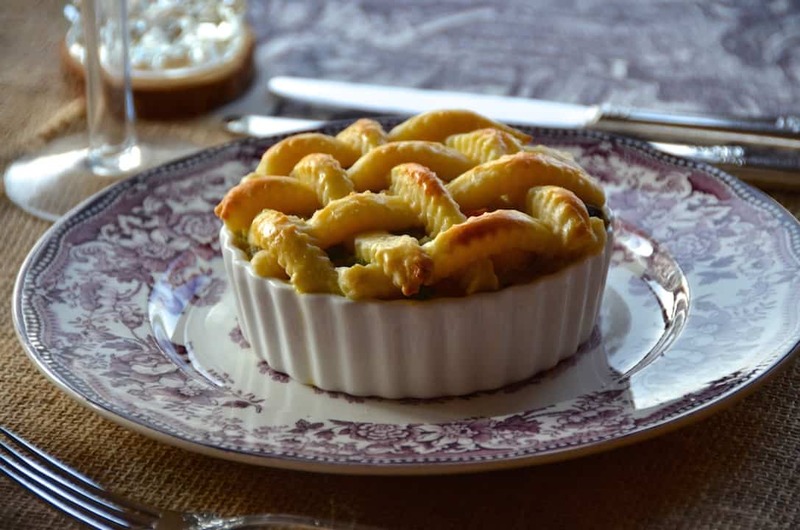 Imagine eight INDIVIDUAL TURKEY POT PIES, complete with woven trellis crusts. Instructions are now updated below. Before you begin, head HERE for our never-fail pie dough recipe. 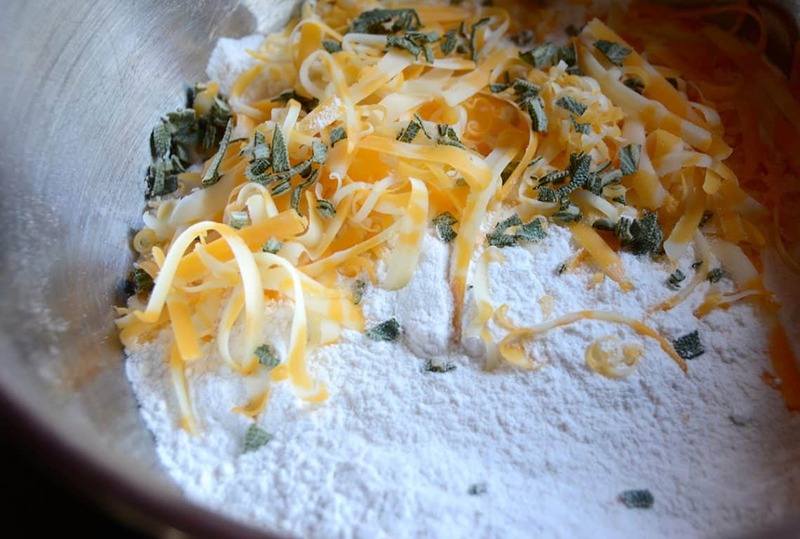 If starting from scratch, consider heightening the flavour profile of your flaky crust by adding ½ cup of grated cheddar cheese and 2 tablespoons of chopped sage into the dry ingredients right before you add the liquid. Plain or fancy, this pie dough recipe is perfect in this application, and we think, easier to work with than making puff pastry from scratch. 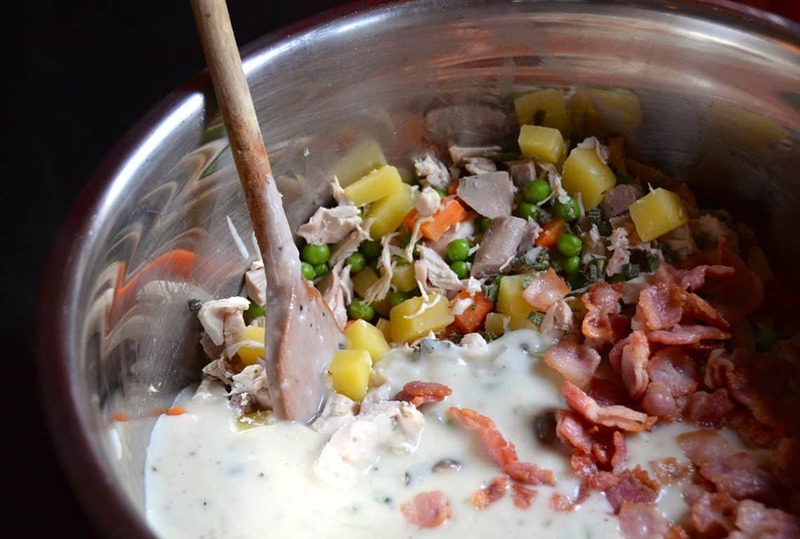 The following tips will ensure your complete success when you make this beautiful recipe. When you do, don’t forget to post photos of your finished pies on your favourite socials using #weekendatthecottage. 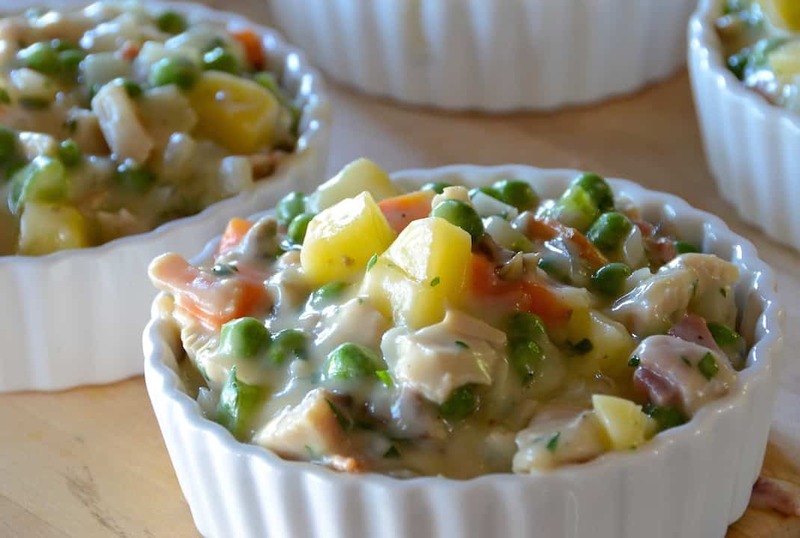 Who’s ready to make INDIVIDUAL TURKEY POT PIES? 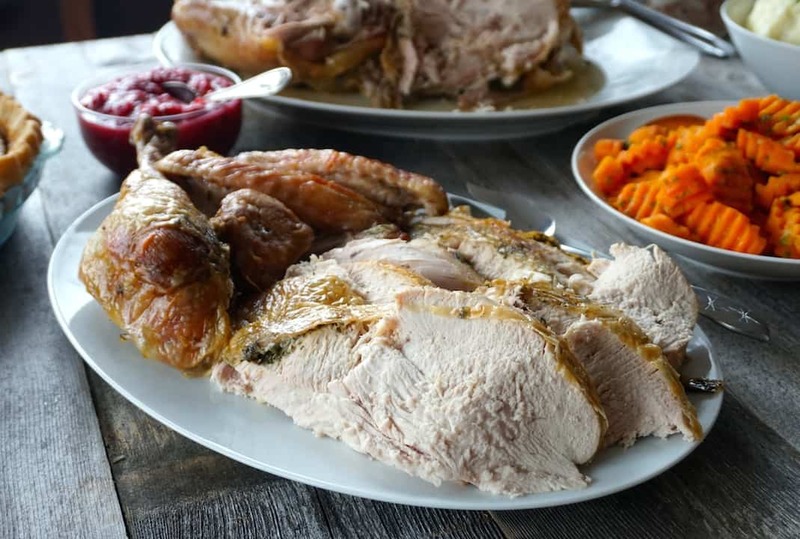 This recipe presents the perfect way to use the dark and white meat left over from your turkey dinner. 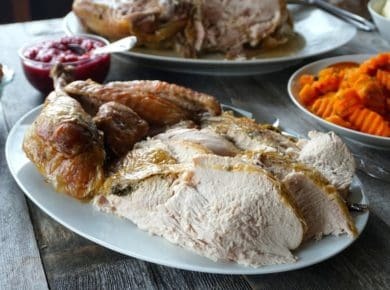 If you need a really good roast turkey recipe, go HERE to learn about our famous DRY-BRINED TURKEY; you’re going to love it! 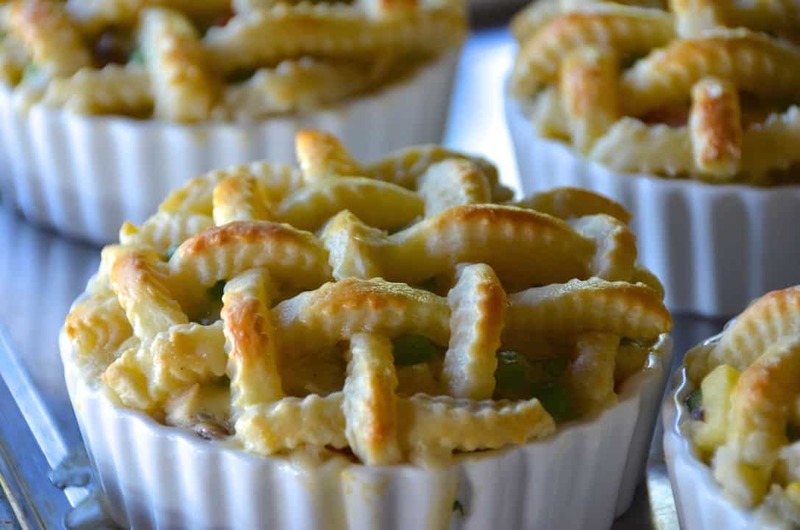 The trellis pastry domes that float over these pies are truly beautiful. If the thought of crafting them makes you nervous, don’t be. Make a pledge to go slowly, step-by-step, remembering that you’re learning a new skill. I have a funny feeling you’ll be a pro in no time. 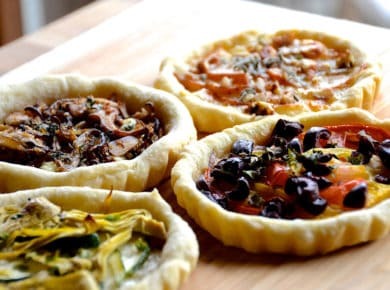 Feel free to assemble your favourite vegetables for inclusion in your pot pies. Parboiled asparagus, parsnips, potato, and even sweet potatoes, will add layers of flavour to your delicious creation. Using wild mushrooms like oyster, shiitake or Shimeji also adds to your flavour profile. 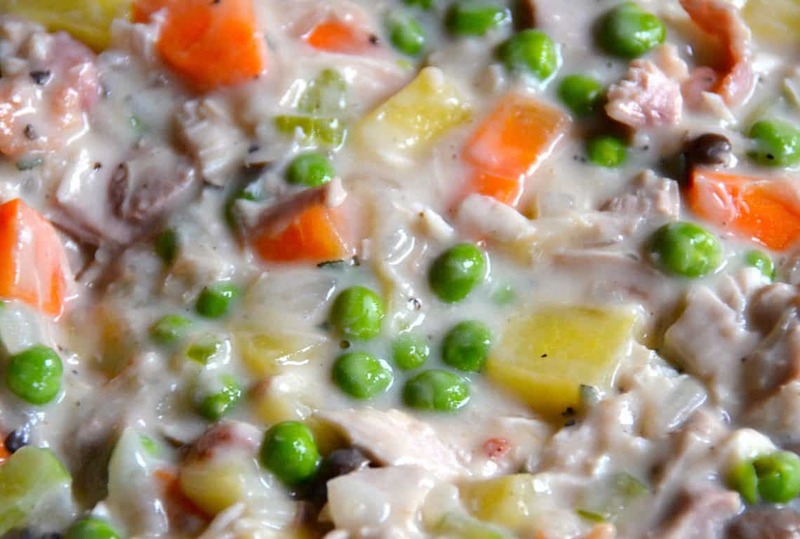 People often wonder what to serve with turkey pot pie. My suggestion is to not over think it. 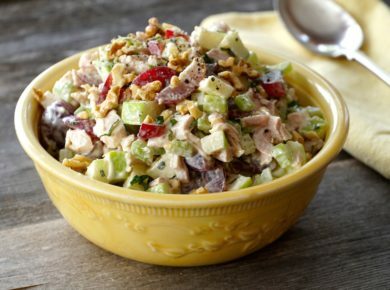 I often present this meal with nothing more than a SIMPLE SALAD or CREAMY COLESLAW. I also like sending the pies to table with a few additional condiments like our CRANBERRY COMPOTE and our POULTRY GRAVY – as if our creamy turkey pot pies aren’t creamy enough already. You can also end the meal with a showstopping dessert like our SPICED PARSNIP CAKE, our BUTTERNUT SQUASH STRUDEL or our easy, peasy BAKED STUFFED APPLES. Lastly, expect some serious magic to happen whenever you make this recipe – the pies will disappear right before your very eyes! 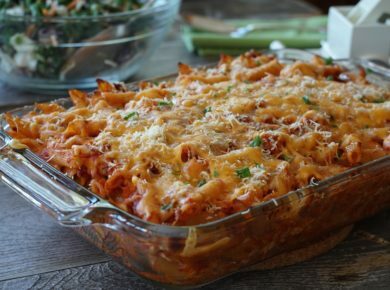 It’s one of our most requested recipes, so what are you waiting for? 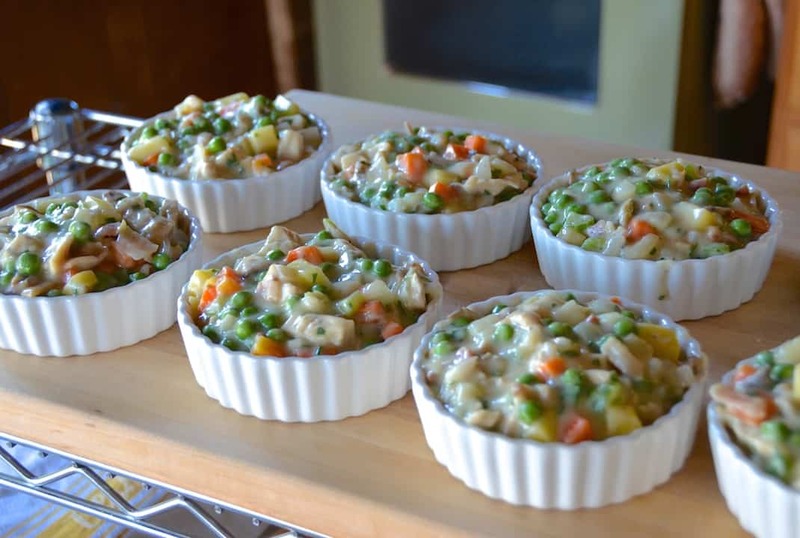 Make INDIVIDUAL TURKEY POT PIES today! Listening to great music is an important part of every Weekend at the Cottage! 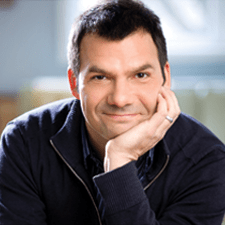 In writing this post I listened to Turkey in the Straw – Squeek Steele. I hope you enjoy this wonderful rendition of Turkey In The Straw – it’s a classic and you can download this album from iTunes.